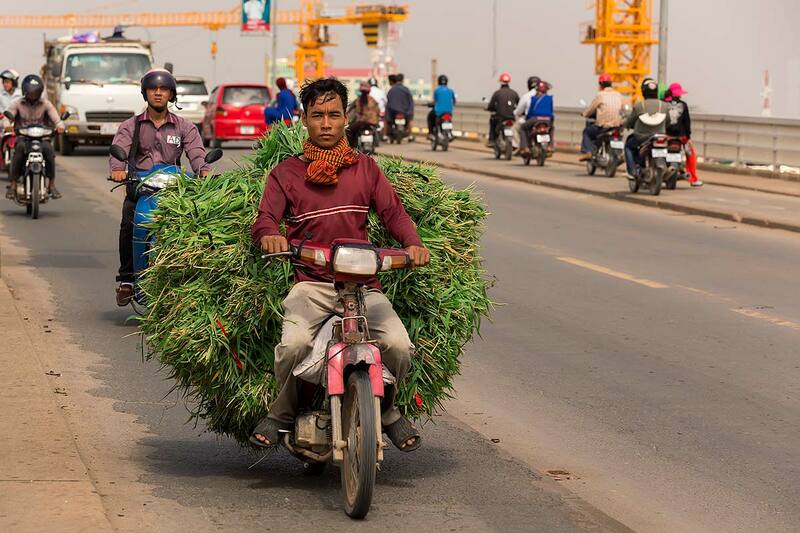 Motorbiking Through Cambodia. | Travel Photography Blog by Nisa Maier and Ulli Maier. The best way to explore a country is to have your own transport. Whether it’s a car, a motorbike or a bicycle. As you may already know, I am female and 56 years of age. The guys at “Lucky Motors” on Monivong Boulevard in Pnomh Penh looked a bit surprised when my sister Andrea (54) and I came in to check out their bikes ;) The decision, which bike to get, was easy: We rented 2 Honda 125 ccm. They’re easy to handle & the locals use the same type of bikes, so in case of a breakdown they’re going to be easy to repair or to get spare parts in any village. The Maier Sisters in Phnom Penh. The price was around 10 US $ per day. You have to pay in advance and leave your passport with the rental agency. So bring some copies if somebody wants it (banks, hotel, etc.). Nobody checked anything from us, nobody stopped us and nobody wanted any bribes…so that part was pretty relaxing for us. My worries where with something else…The drive out of the city of Phnom Penh made me quite nervous the night before we set out. Well, all of my “fears” evaporated instantly when the first meters with the bike were against the one-way system in front of the rental shop (suggested by the rental company). Anyway, off we went, still a bit cautious until we got over the bridge out of the city. There’s so much traffic, but you adjust easily. Day in day out, thousands of motorbikes, cars, trucks and walkers cross the bridge out of Phnom Penh. 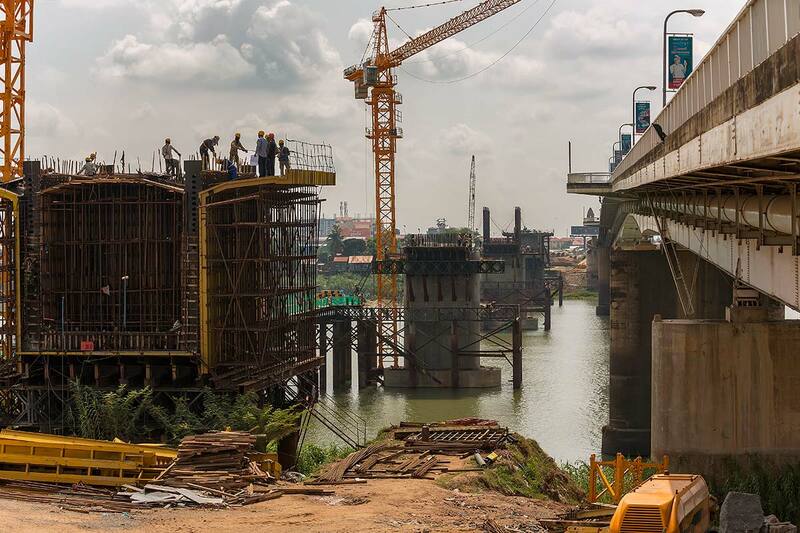 This bridge is the “lifeline” of Phnom Penh, therefore it has to be expanded. 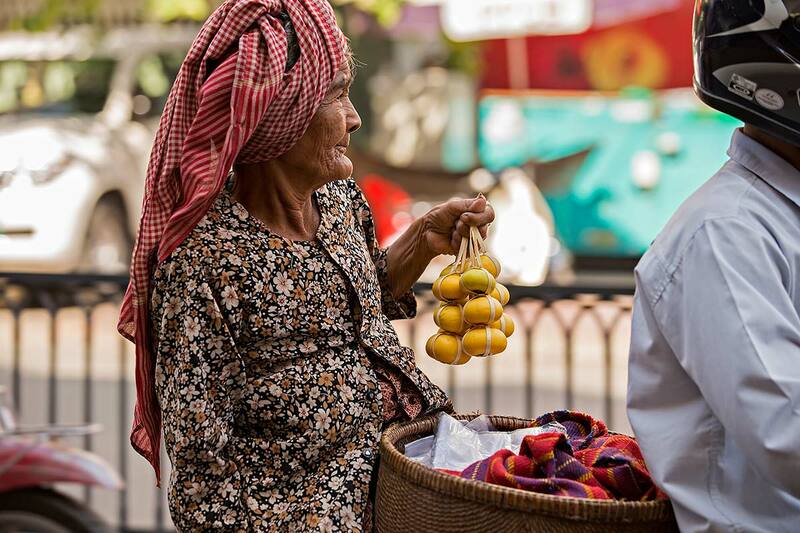 An old woman on her way from the local market in Phnom Penh. 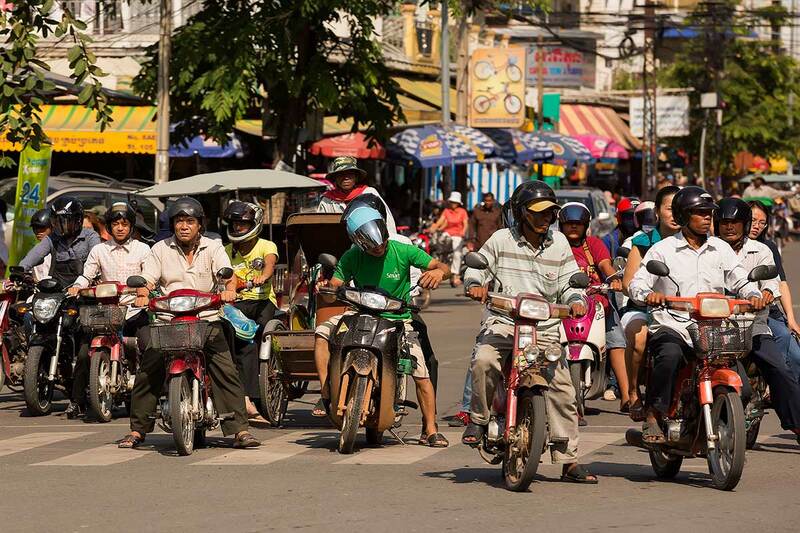 It seems like there are as many motorbikes in Phnom Penh as people who live there. One really important thing is to bring (and then wear) is a helmet. Both of us brought one from home (and all of my friends signed it for good luck which was nice) but you can buy cheap helmets in Phnom Penh as well. You should also use gloves so your hands don’t get sticky. Bring long straps for the luggage, and if you intend to go off-road, a big strong plastic bag is a must – this will keep the dust off. Be prepared to be covered in dust at the end of the day! Now that’s what I call “off-road”. For the worst case scenarios bring a hammock; we had to use our hammocks quite a few times, when no guest-house was around. Sometimes set up our hammocks in peoples gardens, who allowed us to sleep there. We even camped in monasteries, where the monks permitted us to spend the night; and well, one time we slept right in the bush. Sleeping outside can be very cold, so have a blanket ready. Overall it was an interesting and positive experience. 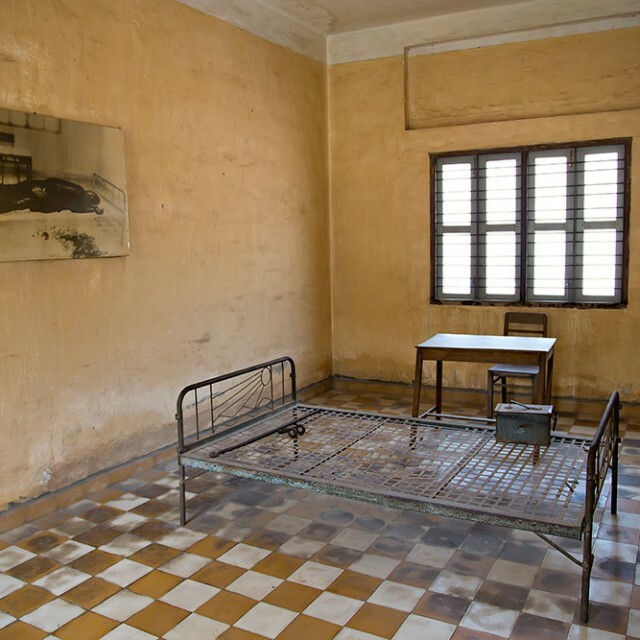 One of our sleeping locations during our motorbiking trip through Cambodia. 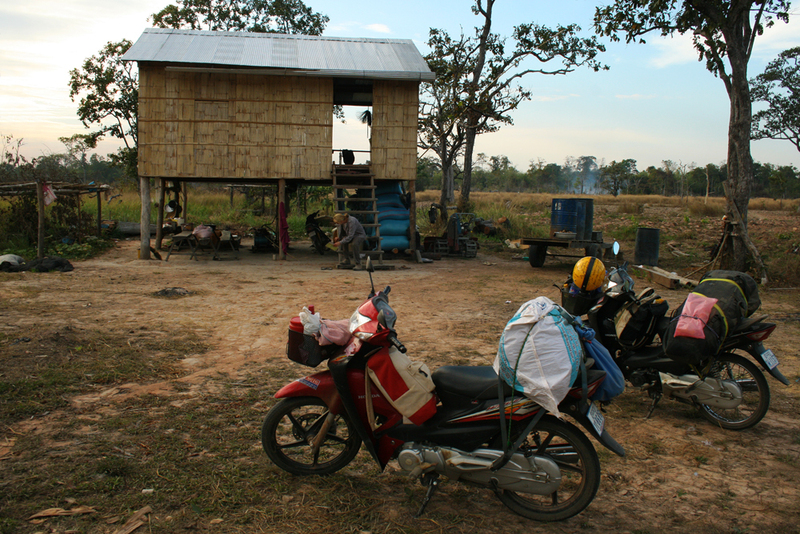 We drove all the way along the Mekong river up north and then turned to the road to Banlung. They told us that the road’s going to be new in some months (or years); until now it’s still the old red soil road which is very (very!) dusty. During the wet season every thing’s going to be covered in mud, don’t know what’s better…Expect to make not more than 100 km distance per day, biking is tiring when driving on potholed dusty roads. 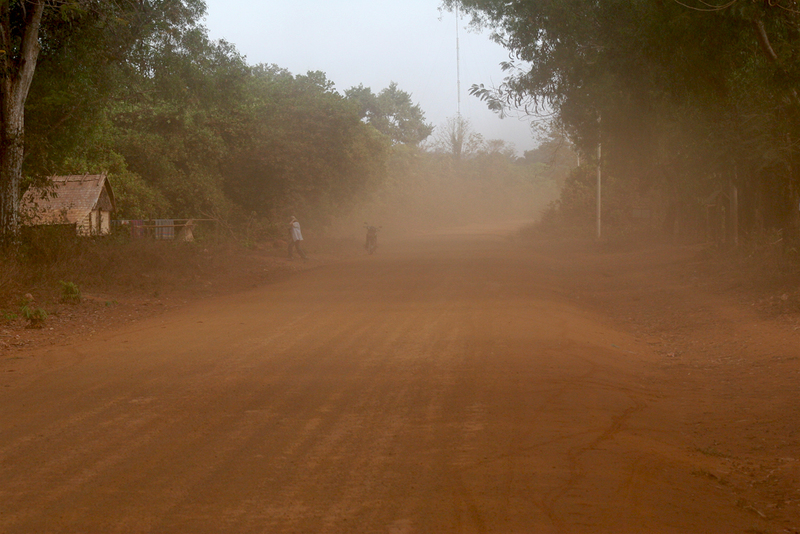 Seeing something gets pretty hard on these dusty roads up North in Cambodia. And back south again on the “Death Highway”. After a few days in Banlung, making daytrips north to the Laos border region and exploring the area towards Vietnam, we set out south to the track that is called “death highway”. It’s mainly a small road, that winds its way south to Sen Monorem with very few people along the way. Occasionally there’s somebody whom you could ask for direction, but they always only point south. So, for this section bring enough water, food supplies and petrol! 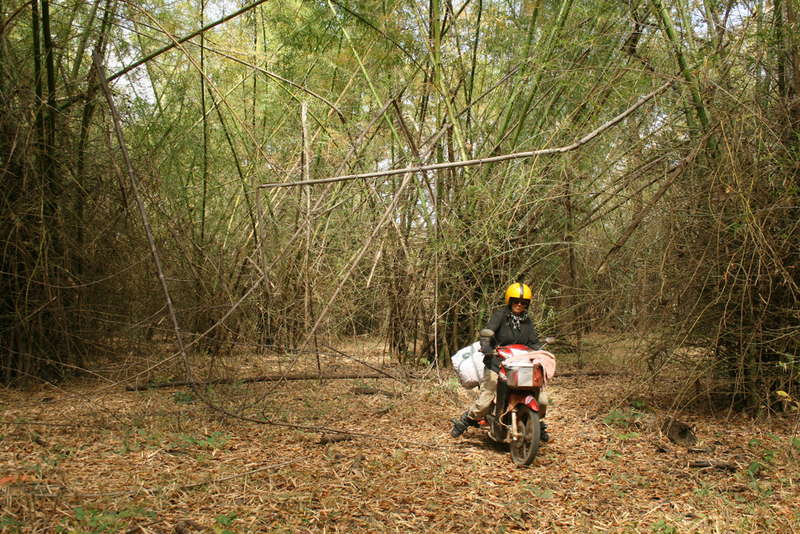 Andrea on her way down the “death highway” in the North of Cambodia. 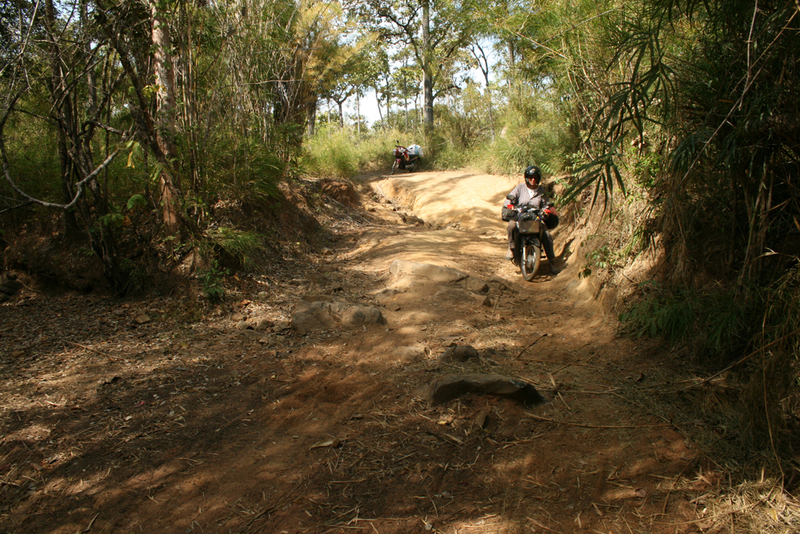 During the dry season it’s a very sandy track with lots of deep rifts, so some fitness helps a lot. It’s doable though, even without using these off-road 250 or 400 ccm machines. The locals drive with the little Hondas as well, so you should be fine. During the rainy season things look a bit different; this road can turn into a nightmare and only very athletic, experienced bikers should ride this section. You will have to shift through lot of mud and traversing the full creeks will need raft building skills above average. Motorbiking through Cambodia was fun & one hell of an adventure! If you have any more questions about the route, the equipment, places to stay or anything else, send us your questions; we’d be happy to help you with your plans. 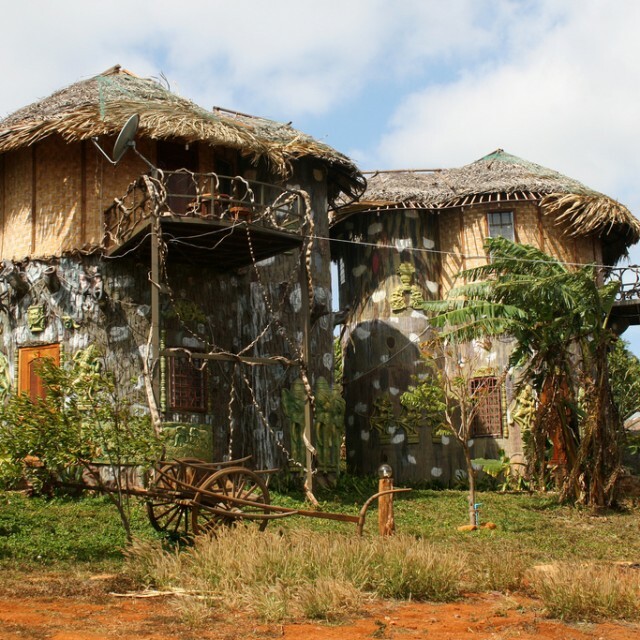 An interesting stopover (for the night) is to sleep in the local houses. You can sing karaoke with them in the evening due to the lack of TV reception…or you can enjoy a yummy dinner (fried frogs thrown into the pot as a whole & still alive). All the best with the project and if you need any more advice, please feel free to contact us. 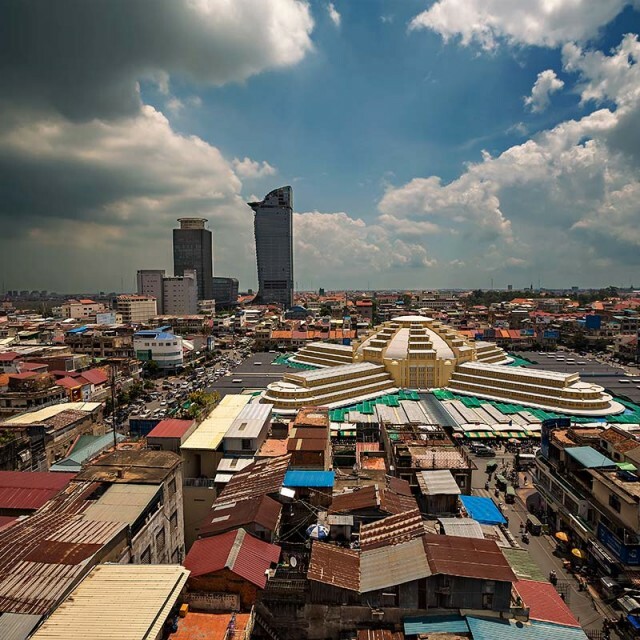 Phnom Penh to Kratie. From Kratie, where you’re come across a big bridge over the Mekong, we drove along the Eastern side, up along the river until the intersection to Banlung (by now the road from there should be paved). From Banlung, we drove North to the Laos border. We always did day trips from Banlung. Banlung has a great lake for swimming btw :) Really perfect! We also drove to the Vietnam border area but again, only day trips and we always back to Banlung. About 50km before Sen Monorem, you’ll arrive in a village and from there you’ll continue on a good unpaved road (maybe also paved by now though). From Sen Monorem we drove day trips to waterfalls and basically into all directions. As soon as we’re back home (one more week), we can send you a map with the entire route if you like. I hope we could help you out a bit :) If you have any more questions, feel free to ask. Hi guys your journey sounds incredible! Me and my partner have just biked Vietnam and are planning to continue into Cambodia, It would be really helpful to see the route you guys took? Also I was just interested do either of you speak Khmer? 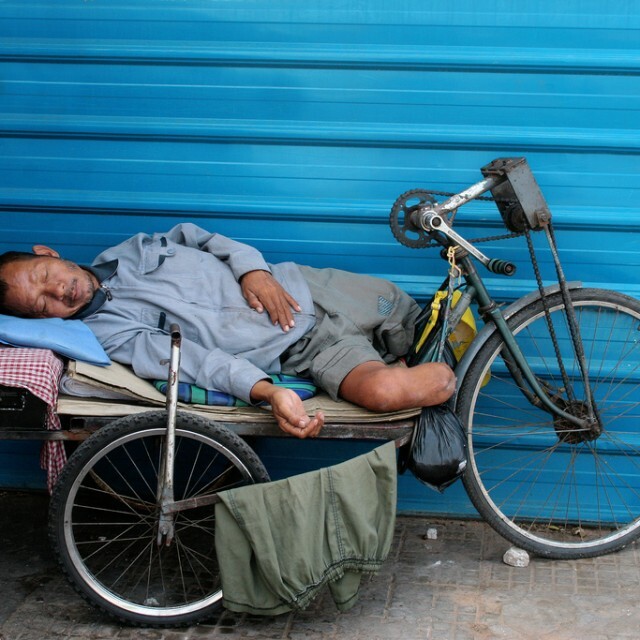 Biking through Vietnam is something that’s really high on our list as well. Did you write anything about your journey? I’ll try to get the map to you by inserting it into the post in the next couple of days! Great tips, I will do this in a couple weeks. Amazing article! I’ve just discovered your website, it’s really great, I hope I can be like you in a few years from now! Keep up! I have a little question, I don’t know if you’ll be able to help me. 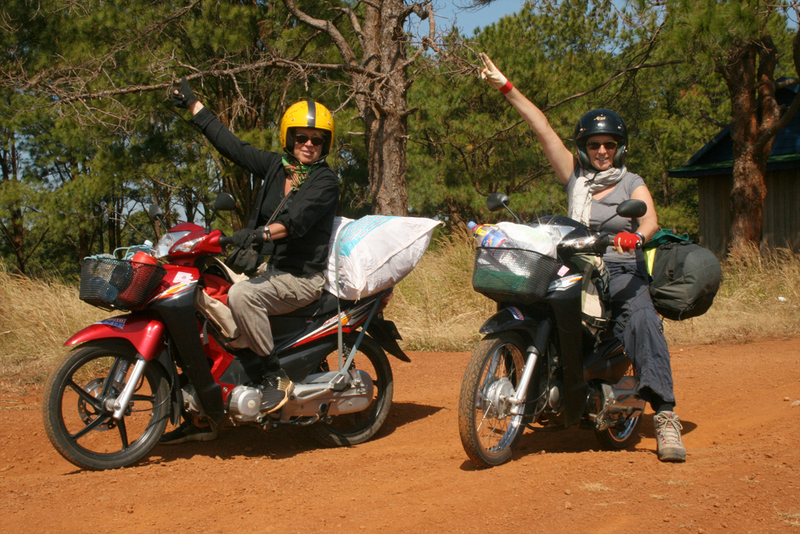 I am planning to go from PP to Siem Reap by motorcycle: do you think it’s possible to rent a bike one way? Pick it up in PP and return it in SR? I’ll come back to read your adventures! Hotel Review: Nature Lodge & Angkor Forest Lodge In Sen Monorom.